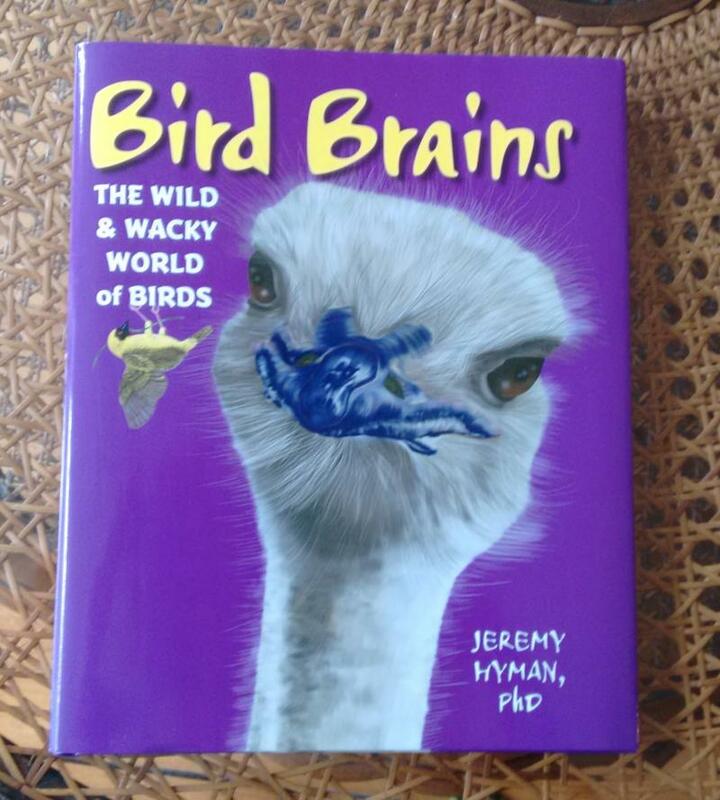 It’s a children’s nonfiction book, nice for adults too, by Jeremy Hyman (text) and Haude Levesque (art). All the art was made with Krita! 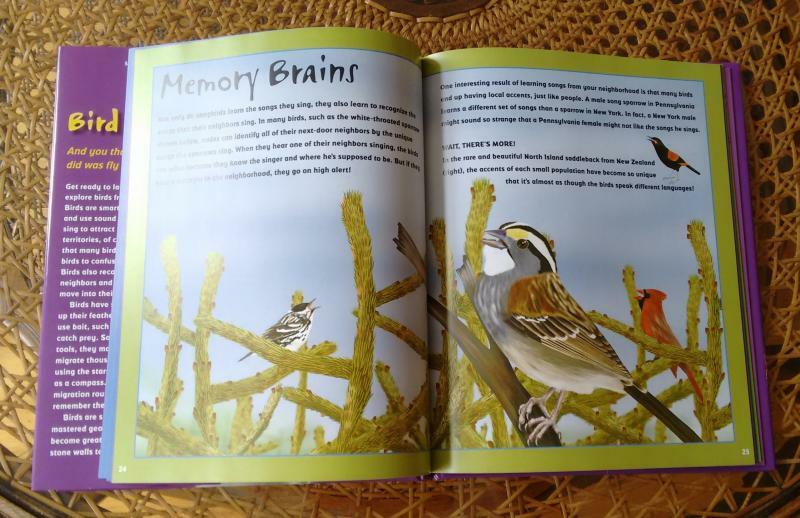 One of my favorite illustrations is the singing White-throated sparrow (page 24-25). The details of the wing feathers, the boldness of the black and white stripes, and the shine in the eye all make the bird leap off the page. 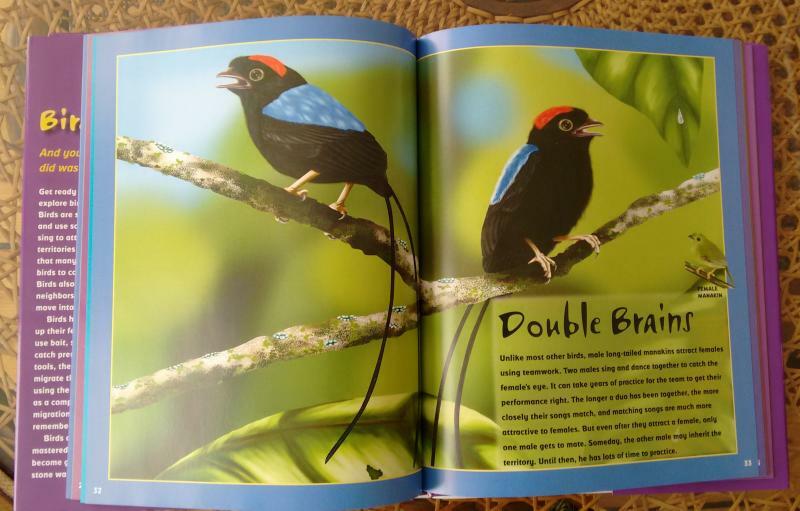 I love the picture of the long tailed manakins (page 32-33). I think this illustration captures the velvety black of the body plumage, and the soft texture of the blue cape, and the shining red of the cap. I also like the way the unfocused background makes the birds in the foreground seem so crisp. It reminds me of seeing these birds in Costa Rica – in dark and misty tropical forests, the world often seems a bit out of focus until a bright bird, flower, or butterfly focuses your attention. I also love the picture of the red-knobbed hornbill (page 68-69). You can see the texture and detail of the feathers, even in the dark black feathers of the wings and back. The illustration combines the crispness and texture of the branches, leaves and fruits in the foreground, with the softer focus on leaves in the background and a clear blue sky. Something about this illustration reminds me of the bird dioramas at the American Museum of Natural History – a place I visited many times with my grandfather (to whom the book is dedicated). The realism of those dioramas made me fantasize about seeing those birds and those landscapes someday. Hopefully, good illustrations will similarly inspire some children to see the birds of the world. My name is Haude Levesque and I am a scientific illustrator, writer and fish biologist. I have always been interested in both animal sciences and art, and it has been hard to choose between both careers, until I started illustrating books as a side job, about ten years ago while doing my post doc. My first illustration job was a book about insects behavior (Bug Butts), which I did digitally after taking an illustration class at the University of Minnesota. Since then, I have been both teaching biology, illustrating and writing books, while raising my two kids. 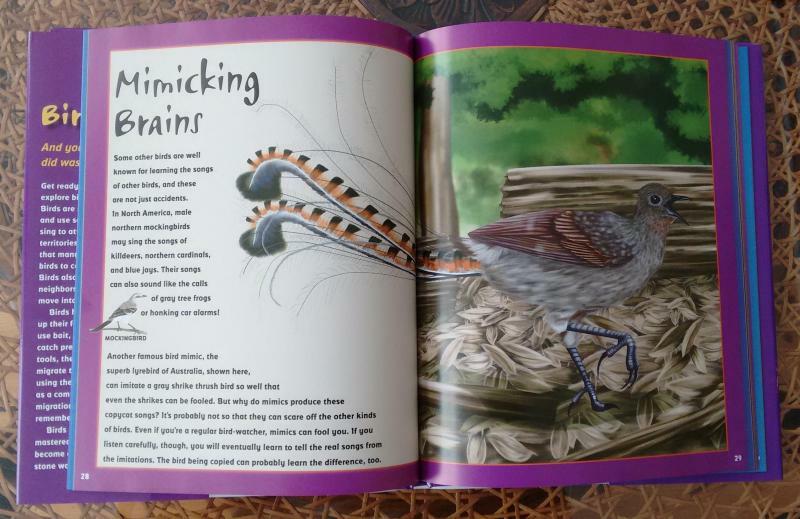 The book “Bird Brains” belongs to a series with two other books that I illustrated, and Iwanted to have illustrations that look similar, which is full double page illustrations of a main animal in its natural habitat. I started using Krita only a year ago when illustrating “Bird Brains”, upon a suggestion from my husband, who is a software engineer and into open source software. I was getting frustrated with the software I had used previously, because it did not allow me to render life-like drawings, and required too many steps and time to do what I wanted. I also wanted my drawing to look like real paintings and also get the feeling that I am painting and Krita’s brushes do just that. 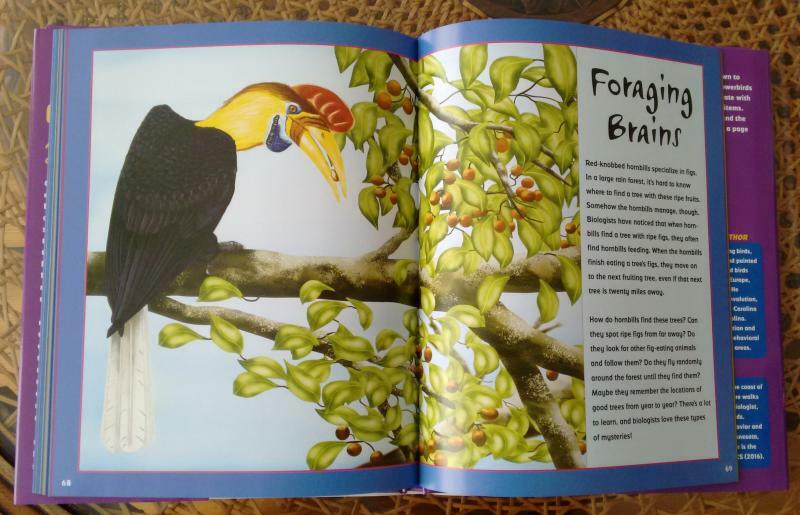 It is hard for me to choose a favorite illustration in “Bird Brains”, I like them all and I know how many hours I spent on each. But, if I had to, I would say the superb lyrebird, page 28 and 29. I like how this bird is walking and singing at the same time and I like how I could render its plumage while giving him a real life posture. 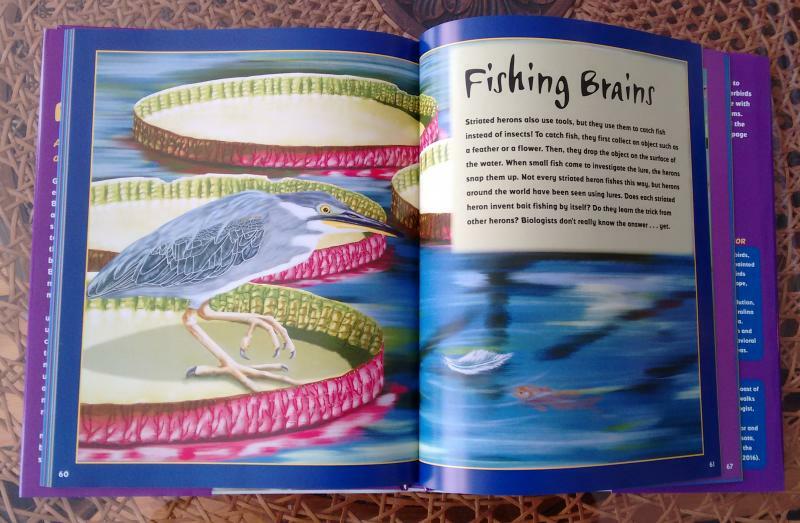 I also like the striated heron, page 60 and 61. Herons are my favorite birds and I like the contrast between the pink and the green of the lilypads. Overall I am very happy with the illustrations in this book and I am planning on doing more scientific books for kids and possibly try fiction as well. You can get it here from Amazon or here from Book Depository.